The sun is beating down as we wind our way through the fantastical maze of rock formations. Following a trail marked out by strips of paint, we scale boulders, zig zag down gullies, and duck our way under natural arches. A lizard darts onto the path, pauses, and then scampers behind a stone before we are even sure we’ve seen it. There is not a tree in sight. Although we are only 30 kilometers (about 18.5 miles) north of Málaga’s city center, it looks like we are on a whole different planet. 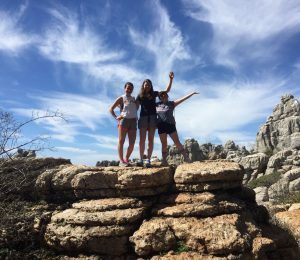 El Torcal de Antequera is a nature reserve that encompasses about 17 square kilometers (approximately 10.5 square miles) of land in the center of Málaga province in Andalucía. The park offers a unique glimpse into Spain’s geological past; in fact, more than 100 million years ago, this land was at the bottom of the ocean. During the Jurassic Period, the tectonic plates shifted and the seabed was shoved more than 1300 meters above sea level. The newly-formed limestone peaks kept their horizontal, layered structure, but were eroded away over time by rain, ice, and wind. This combination of processes resulted in a forest of limestone towers that almost look like a set from a Disney western movie. Although the park appears to be barren, it is actually full of life. There are many wild orchids and other flowers, as well as lizards, small rodents, and birds of prey. Visitors can also find fossils that reveal the park’s secret aquatic past. For a look into human history, simply travel about 15 kilometers (around 9 miles) to the Antequera Dolmens site, which contains three megaliths, or underground stone structures built during the Neolithic and Bronze Ages and used as ritual and funeral sites. 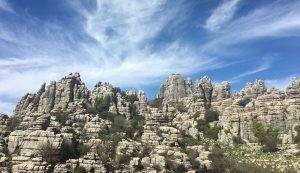 El Torcal was declared a Natural Reserve in 1989, which is one of the highest levels of environment protection that can be issued by an autonomous community (the equivalent of a state in the U.S.). It is also a Special Area for Bird Protection, due to its high level of nesting. Today, the sight is managed by the Environment and Water Agency of Andalucía, and is owned publicly. At a time when the future of National Monuments in the U.S. is in jeopardy, a visit to El Torcal serves as a reminder of the value of preserving natural history.